One of the signs of aging that is most disconcerting to both men and women is the dreaded “turkey neck.” This condition is typically caused by the loss of skin elasticity due to the natural aging process and/or sun exposure, which results in the appearance of slack skin and two vertical bands. Some Beverly Hills patients also notice that their jawlines aren’t quite as sharp as they once were, which is usually caused by excess fat under the skin. Whatever the causes, the “gobble” effect is highly unwelcome to many of us. 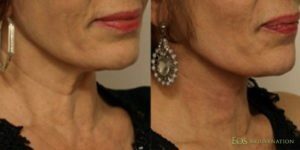 A neck lift could be a great option for Beverly Hills patients who are experiencing loose, excess neck skin or, perhaps, some mild “jowling,” and you want to turn back the clock to restore a tauter, youthful neck and jawline. At your consultation, Dr. Nima will thoroughly evaluate your medical history and carefully explain the options to treat your issues. He may also discuss the possibility of combining a neck lift with a facelift to address more significant jowling and sagging of the facial skin. Dr. Nima’s goal during your first visit is to put you at ease by fully-informing you and helping you set reasonable expectations for the outcome of any procedure. To perform a neck lift, Dr. Nima carefully makes an incision, well-hidden behind the ears, in addition to a small, precise incision under the chin discreetly placed within a normal skin crease. When fully-healed, the incisions are essentially invisible. During the surgery, the muscles are tightened, the excess fat and skin are carefully removed and the incisions are closed. We may send you home with a bandage to apply pressure during the first night, which is removed the next day in-office. Although there is some moderate swelling and bruising for 1-2 weeks, the results are usually apparent immediately. Your stitches are removed within the first week. The results from your neck lift will last 5-10 years. To enhance your long-lasting results, we highly recommend a regular skin care and injectables regimen. Our resident aesthetician is available to work with you on creating a personalized program that combines the most effective products with treatments and procedures to help maintain and sustain the look of your rejuvenated neck. Who is an ideal candidate for Neck Lift Surgery? A neck lift is ideal for those who have loose, excess skin on their necks and/or mild jowls that resemble a turkey neck, as well as for those who want to restore a youthful, tighter appearance to their neck and jawline to ward off signs of aging. Ideal candidates for neck lift surgery in Beverly Hills are those who don’t smoke and do not suffer from medical conditions, such as anemia or blood clotting disorders that could interfere with the surgical healing process. Neck lift candidates should have realistic expectations about their procedures to avoid being disappointed with the results. Can I combine a Neck Lift with other facial procedures? Neck lift surgery is commonly combined with facelift surgery — which can benefit those who have severe jowling and sagging facial skin — brow lift surgery, and eyelid surgery, or blepharoplasty. Brow lift surgery can reduce horizontal forehead wrinkles and rejuvenate the appearance of the forehead, brows, and eyes. Upper eyelid surgery can improve the look of heavy, hooded eyelids, while lower eyelid surgery minimizes the appearance of puffy, baggy under-eye areas that contribute to a tired, older appearance. Non-surgical eyelid surgery may also be combined with a neck lift for those who want to improve their dark, hollow under-eye areas along with an older-looking neck. Is Neck Liposuction required when getting a Neck Lift? Liposuction may be performed with neck lift surgery to remove excess neck fat. Neck liposuction can reshape a double chin or fullness under the chin, and refine the jawline — balancing facial features and enhancing the chin’s appearance. However, neck liposuction isn’t required when getting a neck lift, since this procedure can’t significantly improve sagging skin. Good candidates for neck liposuction in Beverly Hills are typically 20-to-mid-40 years old and should have good skin elasticity. Dr. Nima can discuss whether neck liposuction may be required as part of neck lift surgery during the initial consultation. What other procedures are required when undergoing a Neck Lift? A neck lift can be performed on its own or combined with other procedures including neck liposuction, brow lift surgery, eyelid surgery, and fat transfer. A facial fat transfer helps restore volume to the neck and jowls to improve a sunken, gaunt appearance that can make people look and feel older than they are. The results of neck lift surgery can be enhanced or prolonged with a regular skin care regimen and non-surgical procedures like injectables. Quality skin care products can help firm and tighten skin on the neck, while injectables can help reduce fine lines and wrinkles, keeping the neck looking youthful. What causes a "turkey neck"? A turkey neck is typically caused by loss of skin elasticity in the neck and is characterized by loose, excess skin and two vertical bands. Loss of skin elasticity is a natural aging process and can be caused by genetics, excess sun exposure, muscle weakness in the neck, and smoking. While one cannot change their genetics to avoid turkey neck, people can reduce their chances of developing turkey neck by using sunscreen and protecting their skin from the sun, performing neck exercises, and quitting smoking. Fortunately, neck lift surgery is an ideal cosmetic solution for those Beverly Hills patients who want to improve the appearance of their turkey neck. To schedule your neck lift consultation, contact our office in Beverly Hills at (310) 772-2866.